Epiphytic plant with short stem carrying few leaves (3/5). Roots lengthened, fleshy, flexuous, glabrous, green at their tip. Leaves ligulate, elliptic or elliptic-oblong, recurvate above, undulated, dorsally carinate, long 22 cm. or more, broad 7,5 cm. Flower stalk erect, simple or branching, cylindrical, green, rigid, as long or longer than the foliage. Flattened rachis normally carrying 1 to 2 flowers simultaneously, seldom more. The adult plants often emit several stalks. Largely spread out Flower, from 4 to 5 cm., fleshy, waxy. 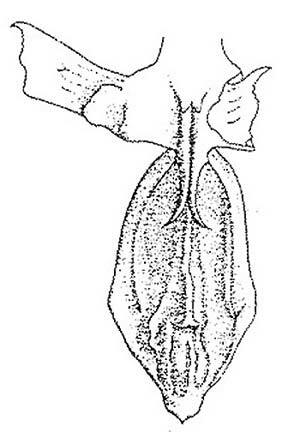 Sepal dorsal oblong-elliptic, slightly ducted apex. Lateral sepals oblique, ovate, almost symmetrical, acute, dorsally carinate, at slightly revolutate base. Petals ovate, sub-rhomboid, obtuse, slightly convex. Lip 3-lobed, glabrous. Lateral lobes oblong-ligulate, erect, fleshy, connivent, ligulate at curved apex, in middle provided with cushion-like callus. Midlobe oblong-ligulate or oblong-ovate, very fleshy, glabrous, in center provided with a finely denticulate keel running from base to tip where it merges with a compressed callus. On each side of the median keel, one distinguishes more or less clearly longitudinal veins. They gave their name to this species. The disc at junction of lateral lobes is provided by 2 superimposed callus. The posterior one, completely yellow is bilobate. 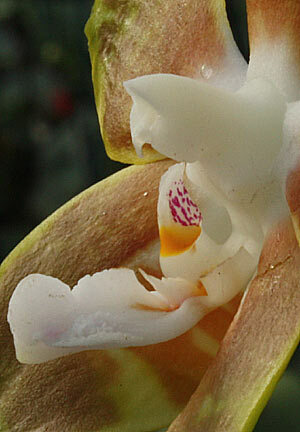 The former callus, white, has two divergent appendices projected above and on both sides of the central keel, longer than for Phalaenopsis amboinensis. Short column, arcuate, fleshy, at widened base underlined by 2 thickenings fleshy. Pedicellate ovary sinuous from 2 to 3 cm long. The floral segments are at white base; yellow or yellow-greenish towards the apex, largely mackled or stained transversely and longitudinally of brown/ochre more or less yellow. Lip with dominant white. White final Callus, central keel surrounded at its base on each side by strippes purplished/mauve. White lateral lobes with a yellow callus. Light suffusion of pink/mauve between the column base, white, and the stigma. The flowering of very long duration is observed in spring and autumn. Sometimes lightly but unpleasantly scented. 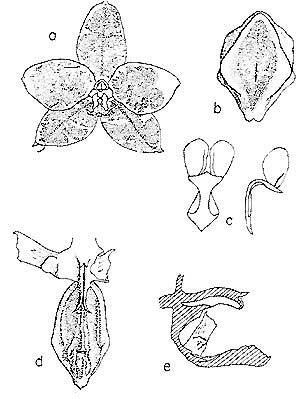 Phalaenopsis of altitude growing from 450 m up to 1000 m.
Phalaenopsis venosa is distinguished from Phalaenopsis amboinensis by the midlobe, broader. 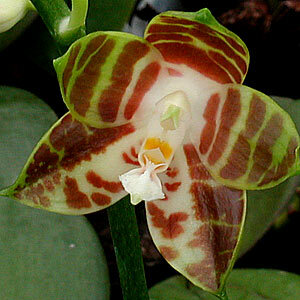 Confused a long time with Phalaenopsis psilantha*(Schl 1911) and first commercialized behind this name. 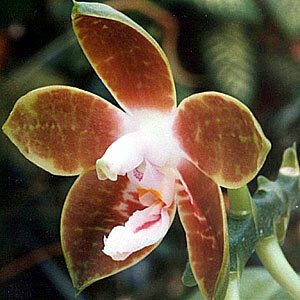 * Phalaenopsis psilantha was initially classified by Sweet like synonym of Phalaenopsis modesta (1969), then like synonym of Phalaenopsis amboinensis (1980).